Once you have qualified as an Open Water diver you will have the skills necessary to dive safely, however, you may now want to explore special diving interests and gain experience. In Open Water, you learned the basics of how to scuba dive. The Advanced Adventure/ Open Water programme enhances your skills and allows you to continue your diving education and learn various underwater tasks that will broaden your capabilities as a diver. It's an opportunity to gain more experience and sample different scuba specialities under the supervision of an experienced instructor. Qualifying as an SDI or PADI Advanced Open Water Diver, you can dive deeper, to 30m which gives you access to a much wider variety of dive sites and marine life. Many larger sea creatures are not seen at shallower depths, and wrecks are generally deeper than the 18m maximum depth of your Open Water Certification. During the programme you will complete 5 adventure dives, Deep and Underwater Navigation are mandatory dives, but with your qualified Instructor, you will pre-select 3 more adventure dives, tailored to your diving interests and the suitability for the dive site and conditions. Upon completion of your course, you will be certified to dive to 30 meters (21 meters for Junior Divers aged 12 - 14 years old). Upon successful completion of the programme, your adventure dives can be credited to the relevant speciality programme should you wish to carry on and continue your dive experience further. Please note: The Open Water Dive sessions at the NDAC will be weather, water temperature and underwater visibility dependent. We are providing this certification through either SDI (Scuba Divers International) or PADI. Both agency certifications are equally valid and recognised worldwide. Please enquire at the centre if you require your training to be through a specific agency. A theory session will be held in the NDAC classroom from 08:30 - 10:30 where the first 3 sections and knowledge quests will be reviewed. 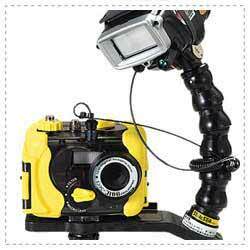 Following kit set up you will complete 3 dives in the afternoon. The theory session will be held in the NDAC classroom from 08:30 - 10:30 where the remaining 2 sections and knowledge quests will be reviewed. Following kit set up you will complete your deep and one other dive for certification. Please Note: For open water dives at the NDAC there is an £20.00 per day entry charge to the site – payable on the day by all students. This is not included in the course fee. Minimum age - 12 years old. Be certified as a SDI/PADI Open Water or Junior Open Water Diver, or have a qualifying certification from another training organisation. 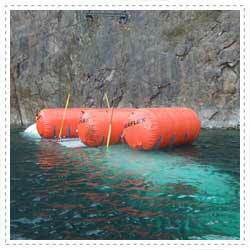 All documentation must be completed, reviewed and signed prior to any in water training. Please contact the dive school for further information or to discuss any personal needs or requirements. The SDI and PADI Rescue Diver programmes are a pivotal step in expanding your knowledge and experience. You will learn to look beyond yourself and to consider the safety and well being of other divers. You will learn how to recognize and prevent a diving accident, assess risk and how to respond if an accident happens. The course emphasizes flexibility and adapting the diver to personal and environmental conditions. Rescue Divers will tell you this course is both challenging and rewarding programme which focuses on adaptation to both personal and environmental conditions. It will make you more confident and prepared in the event of a diving emergency. Before starting the Rescue Diver course you must have successfully completed a sanctioned course in Cardiopulmonary Resuscitation (CPR - Primary Care) and basic First Aid (Secondary Care) within the past 24 months. For students who do not hold a relevant emergency care certification, the First Response Training International (SDI) programme and the Emergency First Response (PADI) programme can be undertaken alongside the rescue course at a discounted rate. 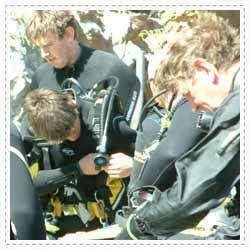 We are providing this certification through either SDI (Scuba Divers International) or PADI. Both agency certifications are equally valid and recognised worldwide. Please enquire at the centre if you require your training to be through a specific agency. Please enquire at the centre if you require your training to be through a specific agency. Session 3 (Sunday) - Open Water Scenario Assessments. Session 1 will be held in the dive school classroom at NDAC and specifically arranged for the convenience of the group. Session 2 – Following kit set up you will practice the required skills at NDAC. Session 3 - Emphasis will be placed on students showing their level of skills during the required scenarios leading to certification as a Rescue Diver. This session will commence at 8am and continue until all requirements are met. Combine the PADI/SDI Rescue Diver course with the Emergency First Response (EFR) Primary Care (CPR) and Secondary Care (First Aid) course and qualify for a discount. Be certified as a PADI Advanced Open Water or Junior Advanced Open Water Diver, or have a qualifying certification from another training organisation. Be certified in Cardiopulmonary Resuscitation (CPR - Primary Care) and basic First Aid (Secondary Care) within the past 24 months. Review, complete and sign all course documents prior to in-water training. For further courses or specific requirements please contact the dive school directly. The ability to provide basic life support to someone who is choking, drowning or are suffering from cardiac arrest, can make the difference between life and death. BLS is included in all first aid training courses, along with related life-saving techniques and procedures such as cardiopulmonary resuscitation (CPR). This skill is especially important for divers as we often find ourselves in remote areas where assistance from emergency services might be some time away. ScubaQuest offers Basic Life Support training via First Response Training International and Emergency First Response. FRTI and EFR courses build lay-rescuer confidence to provide care when faced with a medical emergency. You will learn and practice the same patient care techniques and principles used by medical professionals, but at a layperson level. Though independent study and skills practice with your instructor, you will gain the training needed to help not only a diver in need, but maybe a friend, family member, neighbour or co-worker. Single evening or half day weekend sessions for those who need to update and re-certify are also available. Please speak direct to the EFR Instructor Trainer at ScubaQuest on 07767488795. The refresher course is aimed at those who have previously passed this course but whose certification has lapsed (2years from original certification date). The Refresher course comprises the completion of the exam, an update of any changes in procedure and an evaluation of practical skills. The course will be held on a one day basis at the dive school classroom at the National Diving & Activity Centre (NDAC). These courses are open to non-diving individuals who want to learn Basic Life Support skills, but may also be offered alongside the SDI and PADI Rescue Diver programmes. The course can be scheduled to suit the availability of the group, so please contact the dive school directly for further information. Now you have been diving for a little while and have some experience you may have started to develop an interest is specific areas of diving such as wreck or search and recovery. Speciality diving courses enable you to improve your diving knowledge and skills in a specific area that is of interest to you by teaching you new techniques and give you the tools to enhance your exploration. Below are the numerous specialty certifications offered by ScubaQuest at the National Diving & Activity centre. Get five specialty ratings and you're on your way to becoming an SDI Advanced Diver or a PADI Master Scuba Diver. An SDI Advanced Diver must have 25 logged dives and 4 specialities. Once they have gained this experience they can apply for the Advanced Diver card as a recognition of their experience. A PADI Master Scuba Diver will have successfully completed 5 speciality courses, PADI rescue programme and have 50 logged dives. Welcome to one of SDI & PADI’s most popular specialties - the course/SDI Computer Nitrox Diver. Diving with enriched air nitrox lets you safely extend your no-stop time beyond the no-decompression limits for air. Diving with enriched air means more time underwater but the additional considerations of adding extra oxygen to your breathing gas required you to be certified as an Enriched Air Diver to get enriched air fills. Whether you’re into underwater photography or wreck diving, on vacation in some tropical paradise or just out for a leisurely day of diving at your local dive site, this course helps you get more out of diving by giving you more time underwater. This course held at the dive school classroom at the National Diving & Activity Centre is a one evening or half day theory session and can be arranged to suit the individual student. 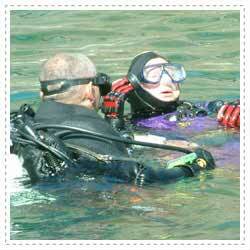 There are no dives required to complete on this course, however two escorted dives can be arranged at an extra cost. In this instance the course will be conducted on a day basis with a theory session in the morning and 2 afternoon dives. For open water dives at the NDAC there is a £20.00 per day entry charge to the site – payable on the day by all students. This is not included in the course fee. Minimum age - 15 years old. Be certified as a PADI/SDI Open Water Diver, or have a qualifying certification from another training organisation. Why dive deep? it’s a wreck that attracts you that’s just below 30 metres, or a giant fan or a sponge on a wall reef. Whatever the reason, to scuba dive safely, with confidence at depths down to 40 metres you require additional knowledge and skills that are provided in the SDI and PADI Deep Diver Specialty programme. Successful completion of the SDI/PADI Deep Diver Speciality will allow you to dive to a maximum depth of 40 meters, the maximum depth for Recreational Divers. As you’ll be venturing deeper into the underwater world, there are inherent risks and a few more considerations. In this course you will learn how to minimise these risks and dive safely to new depths. This course is held over a weekend. One dive can be credited to this course from the Deep Dive on the SDI Advanced Adventurer Diver/PADI Advanced Open Water Diver programme, leaving only three dives required to complete the Deep Diver certification. This does mean that the Deep course can be completed in one (long) day. Please contact the dive school for more information as specific itineraries can be arranged. For open water dives at the NDAC there is a £20.00per day entry charge to the site – payable on the day by all students. This is not included in the course fee. Be certified as an SDI Advanced Adventurer Diver, PADI Advanced Open Water Diver, or have a qualifying certification from another training organisation. Wrecks are where past and present meet and are fascinating to explore. Whether they are lost in war and steeped in history, lost in accidents or purposely sunk, the call of a wreck is nearly irresistible to divers. They offer amazing opportunities and rewards for divers while often having the added bonus of teeming with marine life. However, while there are often incredible things to see on the outside of the wreck, some of the most amazing sites for divers are inside the wreck. While you may have undertaken the wreck adventure dive as part of your Advanced Adventure or Advanced Open Water programme and learned about the hazards and safety techniques of wreck diving, you won’t be able to penetrate the wreck. Through the PADI/SDI Wreck Diver Specialty course you will learn and practice the skills and knowledge that is vital for safe wreck diving along with the additional skills to enable you to safely penetrate a wreck should you so wish. The course is scheduled to run in Plymouth or Weymouth, however, due to the nature of British weather, if there are adverse conditions, it may be necessary to transfer to NDAC. Wreck dives for courses held in Plymouth or Weymouth are undertaken from a Charter boat - Please note that boat fees are not included in the course cost. Further information can be provided at the time of booking. The wreck Speciality programme is completed over a weekend. The theory session for this course will scheduled in accordance with the location. For example NDAC courses will have theory on Saturday morning followed by two dives Saturday and two dives Sunday. If the course is to be held in Plymouth, then the theory will be held in Plymouth on the Friday evening followed by two dives Saturday and two dives Sunday from a charter boat. Students will be responsible for their own travel arrangements and accommodation. The costs for travel and accommodation are not included in the course cost, however accommodation can be arranged for the group. Please enquire at the time of booking. Be certified as a SDI Advanced Adventure diver or PADI Advanced Open Water Diver, or have a qualifying certification from another training organisation. Please Note: The above courses are scheduled for Plymouth and therefore the theory session will take place in Plymouth on the Friday evening prior to course commencement. For other possible course dates or to discuss individual requirements, please contact the dive school. Do you only dive through the summer months? UK waters have some of the best diving and most divers like the opportunity to dive all year round, however, the cool autumnal and winter water temperatures are often off-putting for those who dive in a wetsuit. If you want to stay warm and toasty when diving and dive all the year round then this is the course for you! 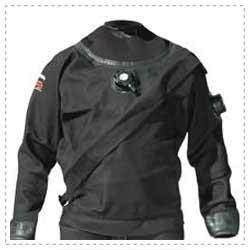 A dry suit seals you from the water and keeps you comfortable, even in cold water. There are some incredible dives to be experienced in the world’s cooler regions and in some areas the conditions are best in the colder months. To take advantage of these opportunities, to become a well-seasoned UK diver, and to open up other diving specialities like Ice Diving, an SDI /PADI Dry Suit Diver certification is essential. The SDI /PADI Dry Suit Speciality course is designed to help you develop the skills, knowledge and techniques necessary for safe dry suit diving. The course will run over one day. Theory will take place at the dive school classroom at the National Diving & Activity Centre (NDAC) from 8.30am – 10.30am. This will be followed by suit skills practice in the confined Water area of the NDAC. All at the National Diving & Activity Centre. Minimum age - 10 years old. Be certified as an SDI / PADI Open Water or Junior Open Water Diver, or have a qualifying certification from another training organisation. If students do not have their own Dry Suit then one can be hired for £35.00 for the course (£150 deposit, refundable when returned undamaged). Being divers, we spend a lot of time around water and sooner or later something may go “splash” from the dock or boat, or even sink to the murky depths while you’re diving. If you’ve ever lost something in the water and wanted to find it, or you are looking for some underwater treasures then the SDI /PADI Search and Recovery Speciality is the programme for you. There are a number of different and effective ways to look for something under the water that significantly improve your chances of finding it, but once you’ve got it, how do you bring it to the surface safely? If you want a new mental and physical challenge this course is for you. The SDI /PADI Search and Recovery Speciality course is where you will learn and develop the necessary skills, knowledge and techniques for safe search and recovery diving. This course is highly recommended for SDI/PADI Rescue Divers, as it will offer you a chance to improve your missing diver search skills. The programme is completed in one weekend (4 dives). SDI Open Water Scuba Diver or equivalent, Minimum age 18, 15 with parental consent. PADI Junior Open Water divers aged 12 or above. PADI Junior Open Water divers with Underwater Navigation Certification. It allows them to make their way back to a special spot discovered on an earlier dive. 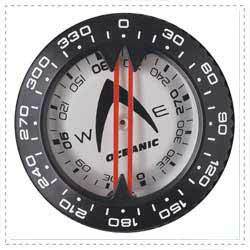 They use the tricks and techniques of navigation to find an ideal exit point at the end of a dive without the need for an uncomfortable surface swim. When everyone’s buzzing about a reef or checking out a wreck, they're having a great time - until it's time to go and they have no idea where they are or where the boat is. Underwater navigation can be challenging, but the Underwater Navigation Speciality course fine-tunes your observation skills and teaches you more accurate use of your compass and is designed to give students a greater understanding and experience of how to properly navigate underwater using both natural and compass navigation. Be certified as a SDI or PADI Open Water or Junior Open Water Diver, or have a qualifying certification from another training organisation. Good buoyancy control and trim have the advantage of improving your enjoyment and safety and extending your dive times within your dive limits by improving your air consumption. Also, what cannot be understated is the added benefit of a diver having greater control of themselves within the delicate aquatic environment thereby preventing damage and destruction. The SDI Advanced Buoyancy Control / PADI Peak Performance Buoyancy Diver Speciality will teach you the skills and knowledge needed to progress and master your buoyancy past the level of Open Water Diver. Minimum age 18, 10 with parental consent. This course is aimed at improving your underwater photography skills using a compact camera. Youll be taking better pictures faster than you ever imagined. Sign up today and start sharing your underwater memories with family and friends. Be certified as a PADI Open Water or Junior Open Water Diver, or have a qualifying certification from another training organisation. Review, complete and sign all PADI documents prior to in-water training. As the sun sets, you don your dive gear, slip on your mask and bite down on your regulator. A deep breath and you step off the boat –and into the underwater night. Although you've seen this reef many times before, this time you drop into a whole new world and watch it come to life under the glow of your dive light. The adventure, thrill and excitement of night diving can be yours when you complete your PADI/SDI Night Diver Specialty course. You learn about night dive planning, equipment and navigation. You practice these on three night dives, plus introduce yourself to the whole new cast of critters that comes out after the sun goes down. To gain the Night Diver certification students must complete three dives. Due to the limited time available for night dives at local diving facilities, this course could be spread out over several weeks. This Specialty course prepares you for the basic equipment maintenance, care and adjustments you'll encounter every day. In addition, you'll get the valuable background on equipment repair and purchase, making you better able to protect your investment. The PADI Oxygen First Aid Speciality will teach you how to safely administer emergency oxygen to a person suffering a suspected pressure related injury such as decompression sickness or lung over-expansion injury. As this is a non-diving certification, anyone can learn these life saving skills. This includes anyone in contact with divers; such as boat crew, non-diving buddies, lifeguards and shore staff. Add this course with the Emergency First Responder Primary Care (CPR) and Secondary Care (First Aid) course for a package discount. Contact us for more details. For ALL speciality courses, custom courses are available on demand throughout the year to suit your time schedule. Please Contact us for further details and to discuss your individual requirements.